Welcome to paradise! Pelican Perch is a spacious three-bedroom, two-bath house, located at 110 Pelican Drive on a canal and a quiet cul-de-sac at the tranquil north end of the island. The comfortable, cheerful house is a great location - just a short walk to uncrowded, powder-sand beaches, excellent restaurants, shops on Pine Avenue, and two fishing piers - City Pier and the Rod & Reel Pier. At Pelican Perch, you’ll find 3 bedrooms, a large living room, a den with a sofa bed, 2 full baths, a dining room and a fully-equipped kitchen. The house has a very open floor plan and numerous seating and dining areas. The dining room has double doors that open onto a porch with a seating area that overlooks the private, heated pool and canal. There is a master suite with a queen bed and adjoining bathroom, one bedroom with 2 twin beds, one bedroom with a queen and a twin bed, and a den with a new queen pullout couch. 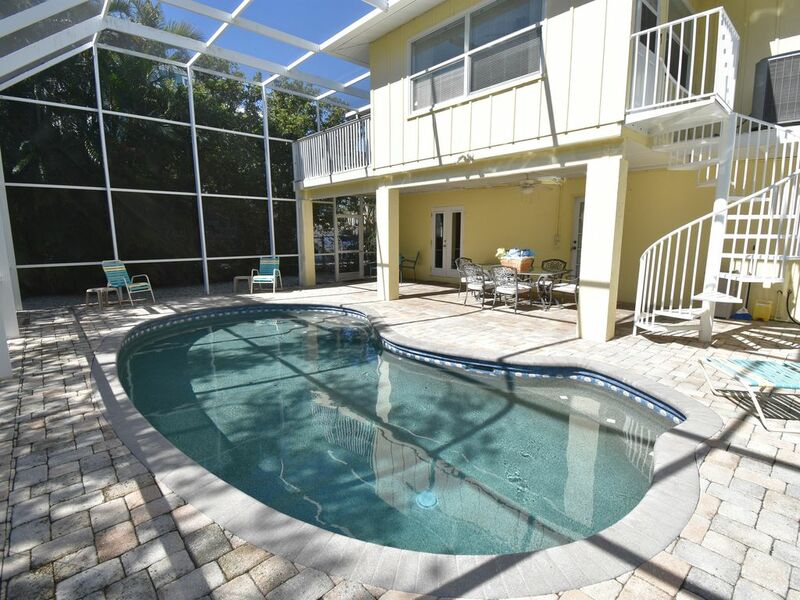 Out back, enjoy the huge private lanai with a lovely heated pool, a large outdoor dining area, a ceiling fan, numerous lounge chairs, a charcoal grill, and an enclosed outdoor shower. Bring your boat! The private dock has a boat-lift and a counter for preparing fish. It is a perfect place for fishing, launching your kayak, and sipping your morning coffee. You may even see a manatee swim by. The house is fully equipped with all the comforts of home including free wifi, four televisions with cable, a DVD player and games including an X-Box. For your beach enjoyment, there are beach towels, beach chairs, umbrellas, beach toys, and a pushcart. Take a short stroll, ride a bike or kayak to the northern tip of the island, where you'll have a magnificent view of Tampa Bay meeting the Gulf of Mexico - it is common to see dolphins playing. There is a short trail near the house that takes you to tranquil Bayfront Park Beach. Evenings are especially beautiful with the soft sound of the birds and breathtaking sunsets. Rent bikes, kayaks, and golf carts (rental companies deliver for free) or take the free trolley and explore the 7-mile long island (the trolley stop is just a short walk from the house at the City Pier). The house worked great for our family. We are a family of 2 adults and 6 kids. There was plenty of sleeping space for us and room to spread out. The kids enjoyed the pool. We’ve been going to AMI for many years. This was the first time renting this house, but we would rent it again. We stayed here with our 18 yo son. It was a bit big for the 3 of us, but it was clean and well appointed. We had other family friends staying on AMI so we spent more time closer to the beach. Nice tv, lovely pool space, and the beach chairs provided were great. My husband and I stayed in BR#2 because the master does not have a TV. (NCAA tournament was on). There are plenty of beach towels which was helpful. The only "situation" was our late check in (AParadise) had our keys under a different name. Luckily they have somebody on call 24/7 and we figured it out relatively quickly. I love this area of Florida and if you need 3 BR this is perfect. It is in a neighborhood but an easy walk to Pine/Gulf. Or Pine/Crescent for the trolley. We had our whole family, eight of us in this house, all adults, and the accommodations were very adequate - plenty of room for us to spread out and have our own space, whether inside or out. The location is absolutely ideal - close to everything we wanted, but quiet and isolated from the hustle and bustle of the island. We biked to most places, and the routes are just so pleasant and short to get to pine ave. and the beaches. Everything is close enough to walk to, also. The house is not new, but everything was in good shape, and perfectly clean. The pool area - the star of the show. It's a small, but really nice pool, and surrounded by tall vegetation, making it very private and relaxing. It was kinda windy during our stay, but the trees and shrubbery provided great protection from it. Lots of shaded area, which was important to us. A big table allowed all eight of us to have some great family meals outside. We also rented kayaks, and took advantage of the canal many times - so relaxing. We would not hesitate to choose this house again. The limited interactions with the owners gave us the feeling that they truly care about providing a positive experience. The house was in a great location and perfect for kids. The pool was warm and the house was very clean upon arrival. Thank you! Property in a superb position on the island, many great points to the house . Lovely dock, outside shower, very nice pool and surroundings. A little disappointed with the things which could have been a little better, very dirty barbecue. No cleaning materials, dishwasher tabs, hand wash , toilet rolls etc etc. Had to go out and buy all these things. We thought these and maybe a small starter pack (milk, bread etc) would be included in the price. Getting the keys for the property did not run smoothly also. All in all a beautiful area to which we all absolutely loved and would return in a heartbeat. Thank you for your review of our home. We do provide guests with starter supplies like dishwasher pods, hand soap, laundry detergent, paper towels, trash bags, toilet paper so we will certainly look into why the housekeeping staff neglected to leave these items for you. This took us by surprise as it has never happened before. Also, thank you for informing us that the barbecue needs to be cleaned, it will be taken care of. We very much appreciate your comments and take them seriously. Thank you again. This place was perfect for our family. We had a last minute location change and the owner so great working with us (we literally booked 3 days before arriving!). The house had comfortable beds, soft bedding, plenty of towels and pillows, decent kitchen stock and the location was even better than it looked on the map! Even with 3 kids (ages 7, 5 and 2) it took 5 minutes or less to get on the beach. Added bonus? Plenty of chairs and floats for the beach WITH a beach cart! What a hell! The screened in pool and dock to fish off of made our trip delightful. This was our second time on AMI and this house was better than the other one we stayed in. I wish we had been able to park the car in the garage but having rentals myself, I understand that needed for owner storage. Two cars fit fine in the driveway so no worries in the long run. The one somewhat negative was that the house “rests” at 80 degrees so it took a full day to cool it down to 74 but that’s such a minor unconvieniece I don’t think it warranted loosing a star. Just be prepared to spend the first day in the soothing pool! (Which my kids were quite happy to do.) Our family will definitely be back. Thank you John!! !